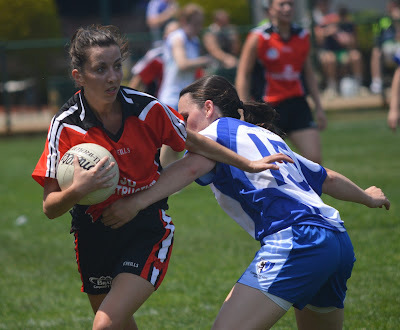 Connacht Ladies had to fight hard against a dogged Tir na nOg side to record an all important win to bolster their title credentials, and leave the Brighton side needing a win in their final game to remain in the championship. The westerners lorded it in the early going only to see their opponents fight back in the second half and come within a great save getting a result. Tir na nOg battled to the end to try and pull off a result. Connacht Ladies had a great first half and played some blistering football with great running in the forward line. Rose Boyle, Jane Ward, and Aisling Reynolds were out of the blocks fast and at times carved open the Tir na nOg defence. With Maria Kelly looking strong in the middle of the field, the Connacht Ladies dominated possession and had tallied six points before their opponents got off the ground in the scoring stakes. Reynolds and Ward finished off some well worked moves to put Connacht Ladies into an early six points to no score lead. As the half time break approached Tir na nOg managed to put some sustained pressure on Connacht Ladies and cut the lead in half. Niamh Crowe, Emma Connolly points from play and a Chloe Ryan pointed free cut the lead in half to make it a 0-6 to 0-3 score in favor of the westerners. The second half saw Tir na nOg pick up their efforts. The Brighton side played the ball well out of the back line and worked hard for each other. Rebecca Stapleton, Maggie Sayers and Emma Connolly helped raise their side’s efforts, while in the front Niamh Daly, Caroline Nee and Niamh Crowe were to the fore. Points from Nee, Ryan and a great effort from Sayers reduced the gap to a goal. But it was Connacht Ladies who came away with the win. Although they were not as rampant as in the first half Connacht Ladies remained very dangerous when in possession and breaking downfield. A Reynolds point following some slick passing was followed by a goal in for Connacht ladies. Another fast breakaway move ended with the ball in the hands of substitute Aoibheann Leahy who was stopped dead in her tracks by Niamh Hynes, but unfairly so and a penalty was awarded. Reynolds slid the kick low past Hynes and the gap was restored to six. With the clock running out Tir na nOg continued to work very hard to pull off a result. Nee and Leahy exchanged points and the Brighton side pulled back three points until just the goal stood between the teams. With relentless pressure on the Connacht Ladies goal, the westerners had to defend in numbers. The best opening fell to Crowe whose shot was saved by Jackie McDonagh and Maria Kelly was on hand to clear. The tall midfielder’s presence in assisting her defence was critical in the final minutes and Connacht Ladies held on to record a hard fought victory. Tir na nOg need a win in their final game against the Shamrocks to qualify for a semi-final place. Connacht: J. McDonagh, H. Ennis, A. Egan, C. Boyle, S. Cleary, M. Peel, E. Hannon, R. Boyce, M. Kelly, R. Boyle, J. Ward, R. Cox, A. Reynolds, R. Curran, A. Kerr. 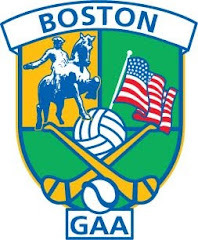 Tir na nOg: N. Hynes, M. Murphy, R. Stapleton, A. McKenna, C. Murphy, C. O’Neill, M. Sayers, E. Connolly, D. Pugh, C. Dalton, N. Crowe, S. O’Callaghan, N. Daly, C. Nee, C. Ryan.